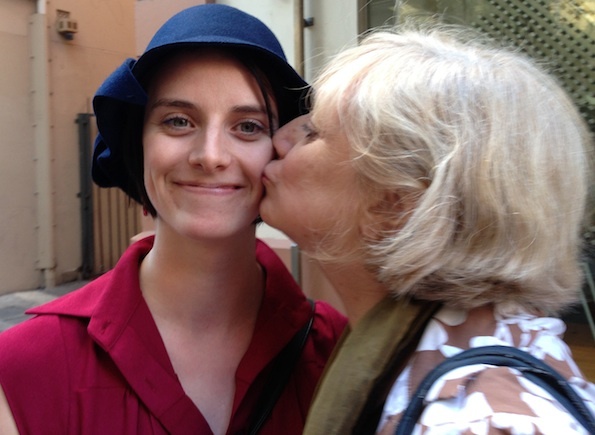 Interview with Alexandra Knox and her mother Jennifer Barry Knox. It was 1964 on a Sunday afternoon. Fifteen-year-old Jennifer Barry was at a ballet rehearsal when a tall woman with a ponytail came into the studio. She was introduced to the group, and then asked them to take their shoes off and sit on the floor. Some of the dancers were horrified, but for Jennifer, this was a life changing moment that set her on a path to become a pioneer of modern dance in Australia. The woman with the ponytail was Elizabeth Dalman, and Jennifer was one of a group of young dancers who began taking class with Elizabeth. On 10 June 1965, this group of young dancers lead by Dalman became officially known as Australian Dance Theatre (ADT). Back in the early sixties, there was no contemporary dance in Australia – or modern as it was known then. This changed when Elizabeth Dalman returned to Australia after working in Europe with choreographers like Eleo Pomare, a Columbian-American choreographer. The experiences Dalman brought home with her were to ignite a passion for modern dance in the hearts of young ballet students like Jennifer, who now had the opportunity to learn the techniques of the modern dance greats, such as Martha Graham, Jose Limon and Lester Horton. Now, almost 50 years later, Jennifer’s daughter, Alexandra, is also immersed in the world of professional dance. But she finds herself in a very different world than that of 15-year-old Jennifer. Based in Adelaide, after moving from Melbourne a couple of years ago, Alexandra is fresh from the premiere season of her first full-length work Cor during the Adelaide Fringe Festival. Cor was made possible thanks to a $15,000 Choreolab residency, an incubator program for emerging choreographers run by Ausdance SA. The Choreolab Residency program was funded through a grant from the Australia Council for the Arts. Alexandra is one of many young, passionate independent dance artists based in Adelaide, who aren’t just looking for work, but are creating their own work. The environment in Adelaide is conducive to the rise of the independent artist, with the Arts SA Independent Makers & Presenters grant programs and Ausdance SA’s strong focus on supporting independent artists through Choreolab, which provides freelance class programs, cheap rehearsal space, grant auspicing and advice. SA independent choreographers can also benefit from the Managing and Producing Services (MAPS) program of the Australia Council, which sees Insite Arts appointed to produce and manage new dance works so they can create, present and tour their work. Other Australian high-profile choreographers that call Adelaide home are Leigh Warren, Larissa McGowan, Katrina Lazaroff and Gabrielle Nankivell. Back in the days of Jennifer’s early dance career, there were no arts grants. In fact, ADT didn’t receive its first grant (for $5,000) until 1971. The company had been surviving until then on fundraising, donations and Elizabeth’s private funds, yet had managed to tour extensively, including international tours to Europe, New Guinea, India and Thailand. These days, dance artists looking to fund their own work need to be savvy grant writers. Alexandra has found the process of applying for grants to be quite useful, in helping her distil her ideas and find her own voice, although she is aware that for many dancers, writing grants is neither a pleasant or easy process, although some are quite good at it. This is perhaps due, in part, to their tertiary training. Jennifer notes that dancers these days are well educated, and this is something else that differs from her early experience, when there were no tertiary dance programs. Whereas now, there are tertiary dance programs at numerous institutions, such as AC Arts in Adelaide, the Victorian College of the Arts (VCA), Western Australian Academy of Performing Arts (WAAPA), Queensland University of Technology (QUT), NAISDA College, Deakin University, Macquarie University … the list goes on. Alexandra herself is a graduate of the VCA. Fortunately, in the sixties, there was Elizabeth who brought her knowledge back from Europe. Ultimately, this meant that when Jennifer travelled to New York in 1968, she was able to walk into any class and hold her own. 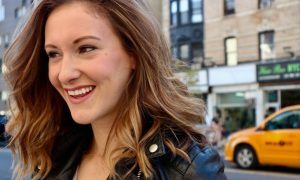 In one class, she recalls another dancer being mistaken for the ‘Australian girl’ because Jennifer was so well-versed in modern dance that she didn’t stand out from the American students as any less experienced. So why is Alexandra following in her mother’s footsteps? Is it simply because she was exposed to so much dance, or is it in her genes? 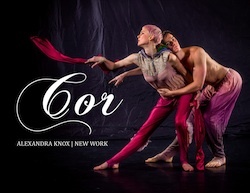 ‘Cor’ being performed at Adelaide Fringe Festival. Photo by Chris Herzfeld. Jennifer recalls being 4 years old when she made the decision to become a dancer. In those days, choosing to be a professional dancer was very unusual, and she found herself ridiculed at school for her choice. But at home, her mother was very supportive and encouraged her to fulfil her dreams. She was adopted, so she doesn’t know if her biological parents were artistic, but she does know she was the first person in her adopted family who had any interest in the arts. So it seems that for Jennifer at least, dancing is in her blood. Jennifer also recalls Alexandra as a one-year old child sitting in her chair, wiggling her bottom in time to the music, and thinking to herself, “Aha, I have a dancer.” It’s harder to tell if Alexandra’s passion is nature or nurture – probably both. Apparently she was always dancing as a child, improvising mostly, and Jennifer and Alexandra would dance and improvise together every night. 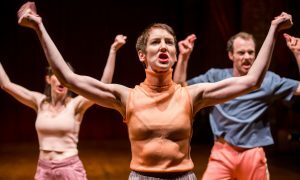 The first work that Alexandra presented in Adelaide was a fully improvised work, Wyrd With Grace, which she first presented at the 2011 Melbourne Fringe Festival, then the October 2011 Choreolab, and again at the Adelaide Fringe Festival in 2012. Alexandra had her first professional gig at the age of 6, dancing with her mother in Meryl Tankard’s Corte a Flora, presented for Floriade in Canberra. Jennifer had never imagined that she would be dancing at age 43 with her daughter in the same production. Alexandra was a pincushion and Jennifer a flower. This experience exposed Alexandra to the world of professional dance and one of Australia’s great choreographers, but also gave her the chance to work with some of Australia’s best contemporary dancers, including Tuula Roppola, Paige Gordon and Michelle Ryan. Alexandra describes the experience as “overwhelming, like an oversize dream coming to life”, but she was inspired by these amazing women who had a great acting ability and dance training. Both Jennifer and Alexandra have returned to Adelaide to be with their mother. Jennifer has been a gypsy most of her life, and she wants to spend time with her mother, who is now 95. After her adopted father passed away when she was ten, it was just Jennifer and her mother, so they are very close. Alexandra is also an only child, and has come to Adelaide to be close to her mother. Their close bond is obvious, and there is a great warmth and gentleness between them. They both share the same eyes – a clear and beautiful green – and an absolute necessity to dance. Alexandra, on the brink of an exciting dance and choreographic career, is now in the midst of writing a grant application for a new work for Next Wave in Melbourne with AC Arts recent graduate Alicia Min Harvie, and she is working in June and July with Adelaide choreographer Katrina Lazaroff on her new work Wasted. Jennifer is currently writing a book on her experience during her time with ADT, which also includes content based on interviews from other ADT dancers at the time. It will be titled Dirty Feet, inspired by a comment Sir Robert Helpmann made to Jennifer at a party – he said that modern dancers were fat, they can’t do classical ballet, and they have dirty feet. Since then, Jennifer has always been careful to wash her feet before a performance. It is perhaps ironic that Alexandra worked with Sydney-based contemporary dance organisation DirtyFeet, which supports independent dance artists and promotes community engagement in the arts. It will be ADT’s 50th anniversary in 2015, so it is timely that Jennifer is writing a book about the dancers’ perspective. Various events are in the pipeline for the anniversary celebration. Wouldn’t it be amazing to see Alexandra dance in the 50th anniversary in a role created for her mother? Photo (top): Alexandra Knox and her mother Jennifer Barry Knox. Photo by Jo McDonald. Thanks to Jo McDonald for a delightful interview article with the very special Jennifer Barry and her creative daughter Alexandra Knox. However it is inaccurate to say that ‘Back in the early sixties, there was no contemporary dance in Australia – or modern as it was known then.’ While there was no modern dance studio in Adelaide until Elizabeth Dalman opened hers in 1964 (and thank goodness she did! ), plenty had been going on in Melbourne since the 1920s, in Sydney since the ’30s and Brisbane from the ’40s. In particular, Gertrud Bodenwieser established her school and company in Sydney in 1939, Margaret Barr opened her studio there in 1951, and among several Melbourne groups, Shirley McKechnie’s (1963) was actually called the Australian Contemporary Dance Theatre. (See Australia Dances: Creating Australian Dance 1945-1965. Adelaide: Wakefield Press, 1910, pp.184-225).